At Thomas Quality Construction, we offer a variety of services to help install and maintain your gutter systems. We provide gutter installation and repair for residential and business properties. Thomas Quality Construction offers professional gutter inspections at any needed time for our clients. Making sure that your home is protected is our priority after every gutter installation. 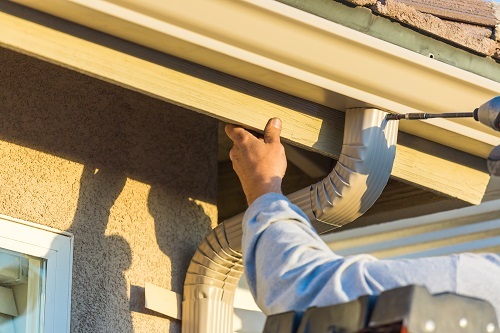 In addition to protecting your home, we also take pride in making sure your investment is protected by maintaining the proper care to ensure your gutters last for a long time. Most homeowners do not have the time or experience in conducting annual maintenance checks on their gutter systems. As a result, homes become prone to mold, mildew and leak damages over time. We recommend calling us for annual checks on your gutters and damage repair in the event your gutters sustain damage. If your home has suffered storm damage, Thomas Quality Construction will work alongside your insurance provider to make sure that you get every dollar you deserve and that your roof and gutters are fully repaired or replaced. Gutters serve many purposes, but the main purpose is for the protection of your home from water damage. Water damage is one of the leading causes to home repair and can simply be avoided with installing proper gutter systems and maintaining them routinely. The perfect gutter installation will properly collect and divert water from your foundation or highly trafficked areas. Proper gutter placement will help protect your home from water damage and can improve the appearance of your home. At Thomas Quality Construction, our gutter services offers a number of materials, styles and colors from which to choose. We offer a variety so that new gutters will properly accentuate the exterior of your home. Your home is your most important investment. Water problems can be devastating to your home, causing damage to landscaping, soffits, doors, windows, fascia boards and even your home’s foundation, one of the most expensive areas of your home to repair. Gutters will protect your investment, redirecting rain away from your foundation and stopping leaks around windows and entrances. Thomas Quality Construction will evaluate each area of your home and the surrounding conditions and factors to determine which gutter system or combination of systems will offer you the best protection and the best value. We get better results because we take a comprehensive approach and use better products. We not only install or repair the gutters themselves, we also provide home exterior wood repairs, gutter guards, fascia, roofing and flashing repair/installation to address water problems as a whole. Because Thomas Quality Construction wants you to have the best protection for your home, we recommend a gutter guard system whenever possible. Cleaning gutters is a physically exhausting and dirty chore that most people try to avoid. Thomas Quality Construction can install new gutters or repair your existing gutters to insure that they are performing to their optimum level of protection for your home. Sleep better at night or relax on rainy days and enjoy peace of mind knowing that you have the proper gutters on your home.